Toyama Bay is where the warm Tsushima current meets the cold deep sea water layer. It’s full of plankton, which are a major food source for fish. The bay’s undersea valleys are a great environment for fish to live in. The warm and cold currents of Toyama Bay and the rough waves of the Sea of Japan mean that the fish that live here have wonderfully firm meat with delicious fattiness. Toyama Bay’s fishing areas are also surprisingly close to shore, and close to cities, making it possible to enjoy incredibly fresh seafood shortly after it was caught. Toyama is one of the birthplaces of fixed shore net fishing in Japan. 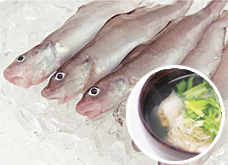 The fishers of Toyama have developed a number of techniques they use to provide fresh, delicious seafood, such as “oki-jime”, where yellowtail are placed into ice water immediately after being caught. 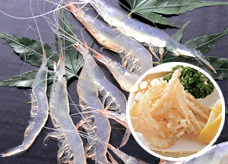 Techniques and preparation methods to make seafood extra delicious have become part of the local culture: dishes like kobu-jime, salted dried seafood, squid kuro-zukuri, masu-no-sushi, kabura sushi, and more have long been the beloved flavors of Toyama. Serving Suggestions: Served with miso and vinegar dressing, marinated in soy sauce and sake or mirin (oki-zuke), etc. 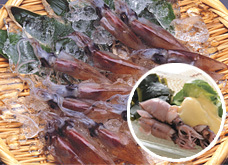 Spring is spawning season for the firefly squid of Toyama Bay, and firefly squid caught at this time of year are big and meaty, with a beautiful sheen. Enjoy their crunchy texture with a hint of sweetness. Serving Suggestions: Sashimi, deep-fried kara-age style, etc. These beautiful shrimp are nicknamed “the jewels of Toyama Bay” for their crystal-clear bodies. 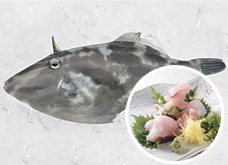 Enjoy their tender texture as sashimi, or try them deep-fried for a crispy, flavorful treat. Serving Suggestions: Sashimi, simmered, etc. 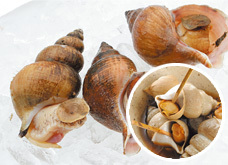 There are four different types of Japanese ivory shell that fishers bring ashore from Toyama Bay. They’re local favorites for more than just their firm yet chewy texture: in Toyama, they’re considered a sign of good luck, so they’re often served at banquets and other special occasions. Serving Suggestions: Grilled with salt, tempura, etc. Ayu(Sweetfish) grow up in both the sea and the clear waters of Toyama’s rivers, and are a delicious part of summer and autumn. These fish are strong enough to fight the rapid waters of the rivers as they swim upstream from Toyama Bay to spawn, making their meat firm and incredibly tasty! Serving Suggestions: Boiled, seasoned with vinegar, etc. 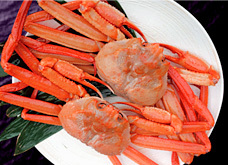 These crabs live in Toyama Bay’s distinctive depths, making them juicy and sweet, and giving their innards a melt-in-the-mouth deliciousness. Boiling them really brings out the red color of their shells. Serving Suggestions: Clear soup, semi-dried, etc. These deep-water fish live in the depths of Toyama Bay. Their gelatinous bodies are full of collagen, making them great for the skin in addition to their great flavor and tender texture. Serving Suggestions: Sashimi, shabu-shabu, etc. 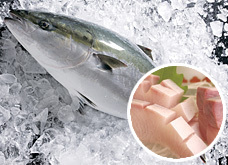 Himi Kan-Buri, or winter yellowtail, is a premium brand known nationwide. Their rich, delicious fattiness pairs perfectly with their wonderful texture, with a deep, mellow flavor they’re known for. Serving Suggestions: Sashimi, hotpots, etc. 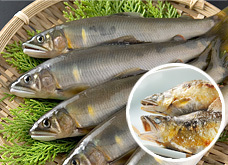 Known for their long, horse-like faces, these fish offer deliciously firm yet tender meat, with richly flavorful livers. These fish are said to be on par with fugu pufferfish.